In Riviera Nayarit luxury means taste, and our taste has developed one of the most delicious gastronomies along the 180-mile coastline in our destination. 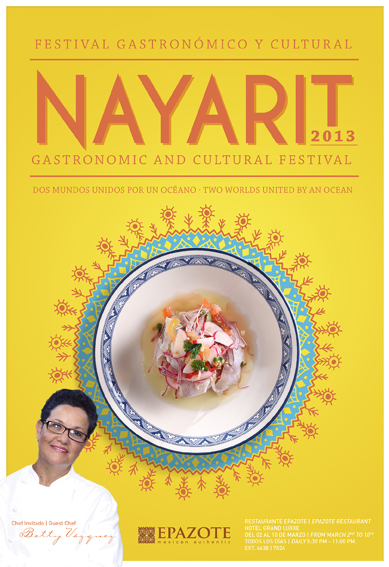 Chef Betty Vázquez from El Delfin restaurant at Hotel Garza Canela in San Blas will showcase our local cuisine at the Nayarit Gastronomic and Cultural Festival, which will take place on March 2 – 10 at the Epazote restaurant of the Grand Luxxe hotel in Grupo Vidanta’s complex in Nuevo Vallarta. “2012 was a wonderful year, as I was able to take the flavors of this destination to 7 countries in two continents, as well as contributing to promote Riviera Nayarit through its gastronomy. We delighted palates and made new friends. 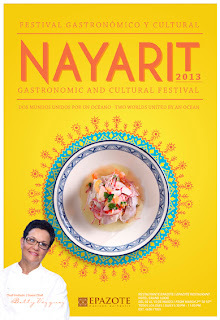 In 2013, we’re starting with this new opportunity to bring the cuisine of Nayarit to one of the most successful touristic developments in the country and to celebrate my first 30 years as a chef together with the talented chef Enrique García and all his staff here in Epazote”, said Betty Vázquez. Plantain dobladitas stuffed with black beans, oyster sopes and octopus San Blas-style, Huichol seafood empanadas with two peppers and coconut, catch of the day with lichi juice, seared tuna with two-chili and raja mole, shrimp enchiladas with nutty mole, peppermint pen shell, duck breast with yaca spread and guajillo pepper, steak with mole and cheese from Sierra del Nayar, as well as many other delicacies await at this festival. The Convention and Visitors Bureau (CVB) of Riviera Nayarit congratulates Grupo Vidanta for their constant efforts to create events that promote tourism in the region and for sharing the competitive advantages of our destination, like our spectacular gastronomy.